Office Move? Protect Your Sensitive Documents. It’s always important to be careful who you trust to come into your place of business as a vendor or a service provider. When your business has access to customers’ sensitive personal information, such as financial records, medical records, and legal documents you’ve got to be especially careful. When you are undergoing an office move or relocation, you’ve got to be even more diligent about protecting sensitive data. Office moves are unavoidably chaotic (granted with the right office movers it is a controlled chaos.) With so much going on, there’s more of an opportunity for individuals with bad intentions (identity theft, for instance) to take sensitive information without being detected. There’s also more of a likelihood that items will become lost or misplaced. During an office move, you’ll be interacting with many people. You’ll also be trusting people to physically handle and transport sensitive data, often without any of your in-house employees present to oversee the process. With so many opportunities for documents to get lost, misplaced, or stolen it’s important to have a plan for keeping this information safe before your move begins. Here are four tips for keeping your sensitive documents safe during an office move. 1. Know exactly what you have. Before you can safeguard confidential records, you need to be aware that you have them in the first place. Keep an inventory of the names of all clients, customers, or patients whose records you have. Note how many folders or boxes of information you have per client. This way, when you have moved into your new office space you can go through this inventory and make sure that everything is accounted for. If something is missing, you’ll know to search for it. In the worst-case scenario (you can’t locate an important file when you’re in your new office) you can take steps to mitigate potential damage. For instance, if you lose a file that includes a client’s financial information, you can transfer that individual’s assets from one account to a new, secure account. This may seem like common sense, but surprisingly it does not always occur during office moves. 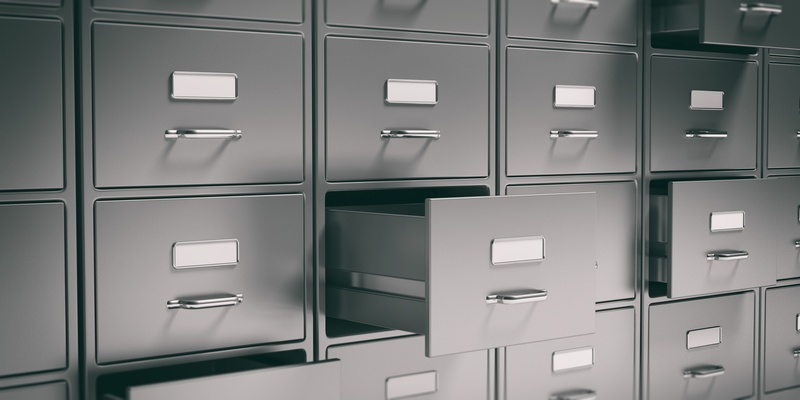 Instead of placing sensitive files in bank boxes or bins, keep them in filing cabinets, lock the drawers, and place the keys in a secure place (like a bank safe-deposit box.) Filing cabinets will keep your documents secure, but they can also break during an office move if they’re not handled carefully. You can reduce that risk by hiring an experienced office furniture installer to oversee your office move. 3. Do it yourself, if it’s manageable. If you don’t have a large number of sensitive, confidential files consider separating them from the rest of your company’s files and holding onto them yourself until the move is completed. Of course, this is only a good option if you have a safe place to store them – such as a fireproof safe or locking file cabinets in another secure location. As tempted as you may be to hire office furniture movers based on price, there are many reasons why this isn’t a wise strategy. You can read up on the five things to consider before accepting the lowest office move bid here. One of those reasons, in regards to sensitive files, is that if even one of your customer’s or patient’s security is breached, you could be sued or even be driven out of business. Your absolute top priority in selecting office movers should be choosing a company that has a long, solid, positive track record and whose movers are professionals who are familiar with the importance of safeguarding sensitive data. Even with a top-notch, experienced crew of office movers and a well-thought-out plan of execution, an office move is stressful. It’s even more stressful if you’re worried about data theft. If you’ll be embarking on an office move in the Houston metropolitan area and you work with confidential documents, you can trust Houston Installation Services. With more than 30 years of experience and a fully trained, background-checked team, you can be certain we take data security as seriously as you do.